How have gender roles changed in society? Historically gender roles have been associated with male verse female inequalities and inequities. Social construction of gender differences throughout history have made males the dominant gender. They have been praised and worshiped for thousands of years as if they were the superior gender. This is also known as patriarchal based society. Societies have perpetuated this form of social behavior of men all throughout history accommodating for hyper-masculine social infrastructures. For centuries patriarchal based societies have flourished and it was not until recently that gender equality was regarded as a successful social behavior. Time has shown that gender roles have continued to change towards achieving equality and equity between genders. In today's society it is becoming increasingly common to see role reversals in relationships, in which the males become the "stay at home nurturer," and the females become the "breadwinners." It appears that this is becoming a more popular lifestyle, especially in our current economy. If society is becoming more accepting and moving towards more relationships exhibiting this "role reversal," then why should females be denied the same social benefits and access to resources that their male working counterparts are receiving? Why do the females in our society get the short end of the stick even though they work just as hard or harder than their male counterparts? These are questions that are consistently being asked and that consistently receive vague and unreasonable responses to. Your salary should not depend on whether you are male or female. Is there any escape from the traditional gender roles? "Around the world, gender is the primary division between people." (Henslin, 2009, p.272) The human species consistently identifies, labels, and groups individuals. This trait automatically sets females in society at a lesser advantage compared to males because of the long standing social tradition that implies that males are the superior beings. Feminism stresses that "biology is not destiny and that stratification by gender is wrong and should be resisted." (Henslin, 2009, p. 272) It has been said that the "glass ceiling is cracking" phrase implies that woman have been able to overcome all the obstacles of sexism that have been placed in front of them. (Henslin, 2009, p. 278) Highly motivated woman have given "up sleep and recreation for the sake of career advancement." (Henslin, 2009, pg. 278) They have also learned to "play by men's rules" in order to advance in their careers as more powerful successful women. Hilary Clinton has become a great American example of a female who has overcome the many obstacles thrown in her path in a primarily sexist society. "Hillary Clinton became the first woman to win a presidential primary." (Henslin, 2009, pg. 281) "Women's fuller participation in the decision-making processes of our social institutions has [have] shattered the stereotypes that tended to limit females to 'feminine' activities and to push males into 'masculine' ones." (Henslin, 2009, pg. 281) A current example of a highly populated career path that is moving towards gender equality is the nursing profession. Historically this role was primarily filled with female employees. Today, the nursing schools across the country are promoting and advocating for males to enroll and earn their nursing degrees/certificates. This example shows how one field is taking one small step towards gender equality. "Capitalism also shapes and makes use of gender inequality." (Johnson, 2006, p. 49) Gender inequality has been engrained into our society throughout centuries making it difficult to change the ongoing habits that have been going on for numerous years. Because of the glass ceiling that has been fabricated towards women's careers, it has been very difficult for females to advance into more powerful and important job opportunities. Just because a system is male dominated does not mean that all men are powerful and should be powerful. There has to be bandwidth for both sexes to grow in order to diffuse gender inequality and shape our society into a well rounded non-sexist community. According to Henslin (2009), your gender will determine whether "you will either benefit from the pay gap or be victimized by it." Women continue to fall victim to this pay gap and still make less than their male counterparts. Henslin (2009) also suggests that a "distinction between the sexes will not disappear but there is no reason for biological differences to be translated into social inequalities." It should not matter whether you are male or female, you should be treated the same and be allowed the same opportunities in all aspects of life, as well as access to the same quality of resources. Johnson (2006) implies that "women are culturally disidentified with power making it harder for them to exercise it in any situation." These structures of power and inequality profile almost every aspect of life in modern society. Johnson (2006) suggests that, "the hope for something better depends on the ability to work together to face that illusion and go through it to the truth on the other side." Based on the curriculum of this course we should now be driven to see past the illusion of a single one way street society and to instead be looking for the multiple paths that make up a society. Driven to see how each of those paths is valuable and necessary to the success of a society, and that no single path is better than another. The sociological perspective is essential in achieving this, we need this set of values to have the capacity to see beyond what is in front of us and more what is beside us. Henslin, J. (2009). Essentials of sociology. Boston, MA: Allyn and Bacon. Johnson, A. (2006). Privilege, power, and difference. New York, NY: McGraw Hill. In America the struggle for racial equality has become an every growing battle with no end in sight. This can't be blamed completely on Americans and their lack of knowledge about racism and the actual definition of race, though it does play a role. The main factor that I'm focusing on is how the media that surrounds everyday life is constantly reinforcing racism amongst Americans without their knowledge. This inequality among races isn't only displayed in the media, but also in other very important aspects of everyday life, such as the workplace. Racism in the media can be as simple as seeing a poster with an all white community to watching a movie where the main characters are white and they happen to be fighting against another race. Examples like these go unnoticed until they are pointed out, which needs to be happening more often. The power of race in America has become so overpowering that is has become deeper than just the color of one's skin, it has become their identity entirely. And with the media backing people's views about race, the future of racial equality has a long way to go. One of the most common, unnoticed forms of racism in the media is the headlines of newspaper articles and captions of photos. These two forms of seemingly simple media can actually impact people more than they think. 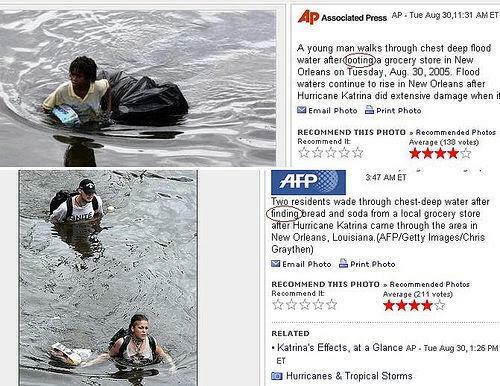 A great example of racism in a caption can be seen from the attached photo containing a picture of a black man sifting through chest high water with food from a grocery store and being described as "looting." While at first this may not seem like such a big deal, it's the fact that moment later in a photo of a white couple, who had done the exact same thing, the description was that they had "found" the food in the grocery store. Only after they were compared can the difference among these pictures be posed. Writer of the article that bore this picture states that, "They are doing the EXACT SAME THING... carrying bags of food that they liberated from the ruins of a drowning city. But, the Black man is criminalized, while the white couple is made to look "enterprising"" (Iovino). These words are of complete truth when describing the way these different racial back grounded people are being described. Which goes to show that even in the small print of a photo caption, racial inequality can still be found. A group known as the Urban Alliance on Racial Relations, which was founded around three decades ago, also had some insightful information on just how much the newscasters, journalists, photographers, and other outlets of news media could influence the population. Some of their insight on this issue is, "Contrary to public myth, journalists, editors, broadcasters and directors of media organizations are not always neutral, impartial, objective and unbiased. The media often selects events which are atypical, presents them in a stereotypical fashion and contrasts them against a pretext of normative White behavior" (Tator). With this insight, it can be seen as no surprise that people of color have been wrongly represented in the news media. Another mass outlet of media that influences people's perceptions of race and in turn instills inequality is the movie industry. The movie industry is one of the largest growing media industries in the United States. This in turn gives it a lot of power in how to portray people of different races. Starting at a young age, children are among those influenced by the racial inequality in movies. One of the targeted movie production companies is Disney because of its success in the movie industry, but also because of its racial inequality as well. Being that children are easily influenced by the things around them, it's hard to hear that the biggest name in movie production could actually be giving them a false view of society. An Israeli educator by the name of Rachel Shalita brings up a very good point in saying, "These are messages that are not necessarily manipulative, but they reflect an extremely conservative worldview in terms of religion, anti-feminism and are problematic with regard to representations of the 'other'" (Shweffi). Shalita has a good point when saying that they are problematic in regard to representing the "other." This can be seen as true when cast against movies such as Aladdin where "they show a market where the signs are meant to be in Arabic but are written in a form of gibberish, it implies there really isn't a culture in existence that uses that language" (Shweffi). This is just one example of many that Shalita brings up in terms of inequality draping over these children movies. Another example is of "The Jungle Book (1967) which portrays gorillas and orangutans that sound like black people and Oliver and Company, with a Chihuahua named Alonzo that is typecast as a Latino troublemaker" (Brunette, Mallory,Wood). With these seemingly small racial suggestions littered throughout children's movies, it's only a matter of time before they have the ability to apply these hidden racial cues to their perception of the world. Along with news media and movies there are also media advertisements as well that harbor a whole new aspect of racism on their own. Out of all the calendar days in the year, the most advertisement watched day has to be during the super bowl. It is during this time that big name companies advertise their new products or display the same product in a new manner. Yet what is being left out is the way in which they do so. The summation of exactly how these companies intend on advertising can best be said by news writer Amanda Hess, "In order to achieve this difficult balance, ad-makers are forced to play within a very small range of acceptably "outrageous" topics. Since casual sexism, racism, and homophobia are main sources of shock-jock humor--and since these attitudes are too pervasive to inspire true outrage in the average American--companies compete to put the most creative twist on the lazy stereotyping without going too far off the deep end" (Hess). This statement is all too true and can be seen in the variety of ads where either someone of color is displayed as negative or not in the ad at all. With advertising being such a big industry, it's amazing to see that some of these utterly offensive and inappropriate adds haven't been exposed for what they really are, racial inequality. Throughout the history of the United States, the color of someone's skin has always played a role in how they have been treated. And with all of the technological advancements in communication and media, ideas and views can be spread that much faster. So in a world where technology is starting to rule, the struggle for people of color to fight for equality has gotten harder. This can be seen from the evidence provided in the previous paragraphs. Racial equality in the United States in reaching every facet of people's lives, from the moment they wake up and read the news, to the moment they sit down for their favorite show at night. With that being said, this ever growing struggle for racial equality may never reach its end unless people truly begin to realize the falsifications they are being fed. Brunett, Libby. Mallory, Caudette. Wood, Shannon. "Stereotypes and Racism in Children's Movies." Online PDF Paper. 10 Oct 2006. Retrieved from the web 15 Mar 2011. Hess, Amanda. "Why Superbowl Ads Are So Sexist, Racist, and Homophobic." Washington City Paper. 8 Feb 2010. Retrieved from the web 15 Mar 2011. Iovino, Joanna. "Racism in the Media: How Eminem Benefits." Best of Blogs. 2011. Retrieved from the web 15 Mar 2011. Shweffi, Dana. "Do Disney Movies Promote Anti-Semitism and Racism?" HAARETZ. 18th August 2009. Retrieved from web 15 Mar 2011. Tator, Carol. "Taking a Stand Against Racism in the Media." Media Awareness Network. Oct. 1995. Retrieved from web 15 Mar 2011.